“Before the literacy classes, we were like ‘sticks in the bush’ but now we are respected and have a voice in the community.” Literacy circles in The Gambia give women the time and space to come together, become more independent and build their self-confidence. The participants decide what they need and want to learn, such as basic numeracy skills so they give the correct doses of medicine to their children, avoid being cheated at the market and make telephone calls independently. Many of the women who participate didn’t have the chance to go to school, as they had to help with domestic duties from a young age. The literacy circles also enable people to develop their communities by identifying their needs and drawing up Community Action Plans. (CAPs). This could be for a school building, labour-saving devices or equipment and training in skills such as soap-making. When a CAP is well put together AVISU/Village Aid can find funding for the project. 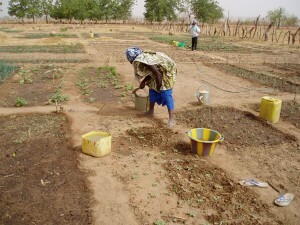 One good example of this is the Jahaur Mandinka Women’s Garden. 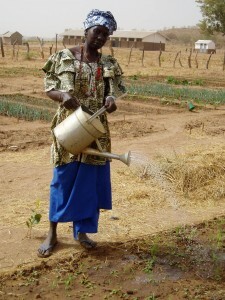 AVISU initially provided spades, forks, watering cans and fencing to establish the garden whilst the community helped to clear the land for cultivation. Each woman has 7 small plots of land, providing them with the means to feed their children nutritious food and the opportunity to have some financial independence by selling any excess produce at the market.